The Kelley Course is a 13.1 mile measured loop, all on paved roads. Race starts and finishes in Ocean Beach Park. Plenty of parking, arrive early to avoid heavy beach traffic. Mostly flat with a few rolling hills, long hill at eight miles. Enjoy panoramic vistas of Long Island Sound on the way out and on the return to the beach with rural roads and a commercial stretch in Waterford. Course is very well marked, all turns and mile marks in green paint. Roads are open to traffic, runners are asked toplease exercise caution at all times. Eight official water stops on course. New London Police, Waterford Police, and Waterford FirePolice will be on the course at busy road crossings, along with N.L.F.D. at start/finish line. The Kelley Course was a 11.6 mile measured loop. New England Runner Magazine "2012 Race of the Year" Oldest shoreline race in Connecticut. Start and finish at beautiful Ocean Beach Park in New London, Ct.
During the 50's and early 60's, Schaefer Day was an annual sports-oriented event, with swimming contests at the Ocean Beach Pool, auto races at the Waterford Speed Bowl, and a fireworks show at the New London Pier. In 1963 event sponsor F & F Distributors representing the F & M Schaefer Brewing Company met with Beach Manager Tony Pero, also attending the meeting were, John Priolo, Anthony Sabilia, and John Dempsey. 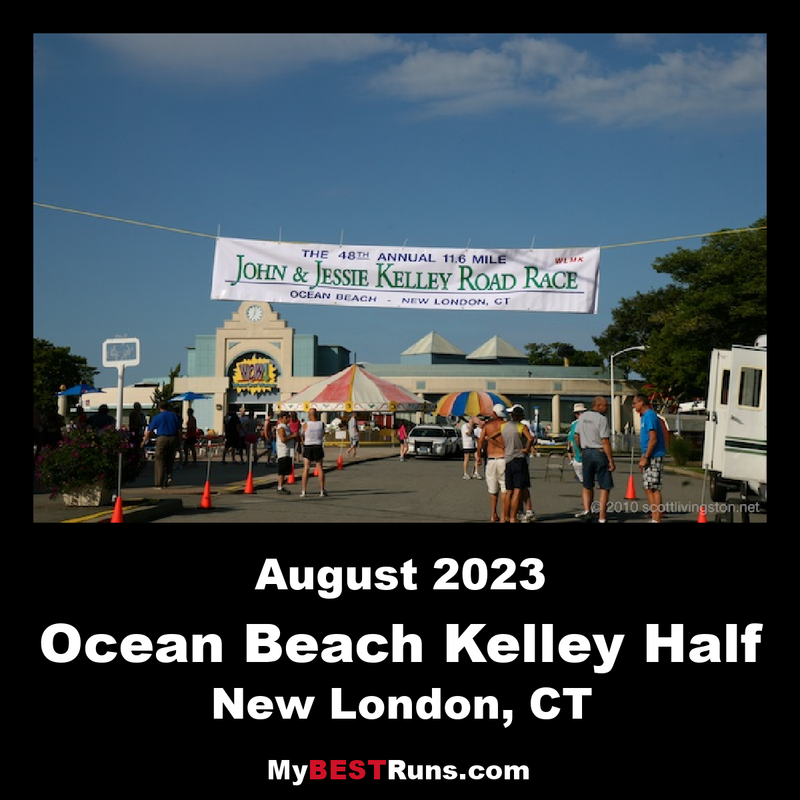 The plan was to organize a 12 mile road race on the roads of New London and Waterford, starting and finishing at Ocean Beach Park. A plan was adapted for the race which is always held on the first Saturday in August. From inception, race has been no entry fee. The first running of the Schaefer Race in 1963 drew 19 starters and was won by John J. Kelley, a native of New London, then living in Mystic with a time of 54:51.4 over the 10.5 mile course. The 1957 Boston Marathon Champion, Kelley won the first two races, followed by three straight wins for Amby Burfoot, the 1968 Boston Marathon Champion. Another local runner, New York City Marathon Champion Norm Higgins won the race in 1970. Over the years the course distance has changed several times due to road construction. Traditionally starting at noon, moved to 10:00 a.m. in 1980, and moved to 9:00 a.m. in 1989. The race was billed "for serious runners only" and the quality of winners backed this claim. Women first appeared in the Schaefer race in 1970 when Nina Kuscik of New York finished in 72nd place. That year the race had 148 entries, topping the 100 mark for the first time. 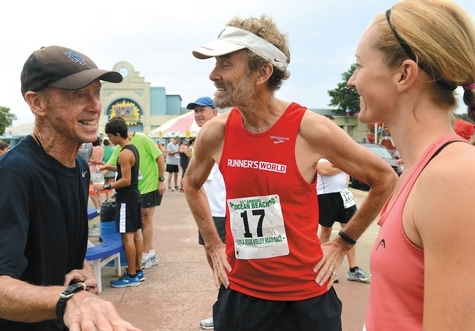 Race Director, John Priolo changed the race name in 1974 to the John J. Kelley Road Race, as an expression of gratitude for the veteran runner's many road racing accomplishments. In 1977 the race attracted 204 runners, sending the entry list over 200 for the first time. When John Priolo moved to Florida, Anthony Sabilia and John Dempsey took over as race co-directors and in 1989 they passed the reins to Way Hedding. In 2003 Jessie Kelley's name was added to the race title following her death in 2003. In 2012 the race drew 758 official entries. Selected by New England Runner Magazine "2012 Race of the Year". Beach Manager Dave Sugrue and his very capable staff will be on hand to insure everything runs smoothly at the beach. Race timing provided by SNERRO, who has timed this race from it's inception in 1963. The Kelley Course is a13.1 mile measured loop, all on paved roads. Race starts and finishes in Ocean Beach Park. Plenty of parking, arrive early to avoid heavy beach traffic. Mostly flat with a few rolling hills, long hill at eight miles. Enjoy panoramic vistas of Long Island Sound on the way out and on the return to the beach with rural roads and a commercial stretch in Waterford.